Gentle low-foam cleanser to remove pollution and excess oil. Also ideal to cleanse skin types with pimples or acne. Its delightful citrus aroma deep cleanses the skin and pores to eliminate toxins, pollution, oil and makeup from the face to leave skin looking softer. It lathers gently and cleanses thoroughly. Enriched with aromatherapeutic oils like tea tree and mandarin to clean up and purify skin. Aromatherapy: mandarin & tea tree, energizing and skin protecting. 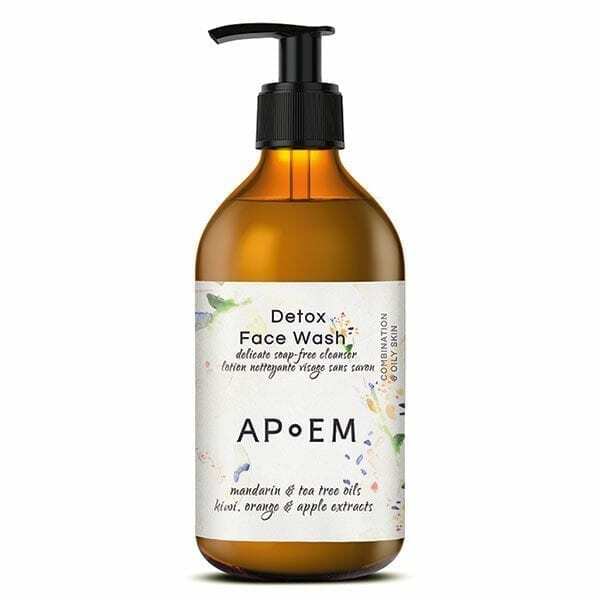 Phytotherapy: kiwi, orange & apple, skin tone evening, moisturizing, skin dynamizing and, in particular, exfoliant properties, for a renewal of skin’s surface. Vegan – 97,3% Natural by ISO:16128 – Eco-Friendly – Cruelty Free – ingredients of Natural Origin – Gluten Free – Pregnancy Friendly + 3 months – 100% of ingredients approved by any certification. For oily or combination, or acne-prone skin. Also normal skin types looking for a matte finish. Fantastic cleanser, such a pitty you don’t have small sizes for travelling, it would be great to use ir on the go as i wash my face very often. aqua (water/eau), glycerin, palmitic acid, stearic acid, sorbitol, cocamidopropyl betaine, disodium cocamphodiacetate, actinidia chinensis (kiwi) fruit extract, citrus aurantium dulcis (orange) fruit extract, pyrus malus (apple) fruit extract, citrus reticulata (mandarin orange) peel oil, melaleuca alternifolia (tea tree) leaf oil, lactococcus ferment lysate, arctium majus (burdock) root extract, camellia sinensis (green tea) leaf extract, panax ginseng (ginseng) root extract, ginkgo biloba (ginkgo) leaf extract, betaine, gluconolactone, calcium gluconate, lactic acid, hydroxyethylcellulose, potassium sorbate, sodium benzoate, sodium chloride, potassium hydroxide, ethylhexylglycerin, limonene, flavor (aroma). *100% from natural essential oils. Apply day and night on wet skin as a cleansing product, massage and remove with the aid of a cloth or cotton pad. Rinse thoroughly with lukewarm water. A pearly, mandarin-scented gel that disappears on contact with the skin and turns into a subtle white color in contact with water. Cleanses without damaging the lipid barrier, leaving a pre-moisturized sensation. Smooth and soft skin free of impurities, with a refreshing matte effect.